Every year on New Years Eve I feel incredibly conflicted. My boyfriend would prefer to stay in with Chinese food and watch the ball drop from the comfort of the couch, while my plans always seem to generate around some fantastic night with a fantastic dress in fantastic shoes (that aren’t comfortable) with our fantastic friends. I spend the days leading up to NYE toying between having the NYE of my dreams or just giving up on the “perfect night” and relaxing. This year again my boyfriend will reluctantly be dragged off the couch. Whatever your plans may be, a good glass of bubbly at midnight (if you drink) should be on the agenda. Even if you’re on the couch with Chinese, nothing says Happy New Year like a flute of champagne or sparkling wine. I recently attended a tasting at Bin 604, my favorite wine shop in Baltimore, and tasted through several bubbly wines that are perfect for ringing in 2014. Below you will find 5 wines that I think would be great for any NYE celebration. They range in price, but are reasonable for a quiet night in or a big night out. The Bouvet “Rose Excellence” NV from the Loire Valley in France was one of my favorites of the night. Light pink in color, this light and fresh sparkling wine made from Cabernet Franc boasts notes of cherries and light floral tones. It will truly please anyone you pour it for, and at $14.99 a bottle, it will please your wallet too. An interesting sparking wine from Spain made the tasting list that night, and I’m glad it did. The Castellroig Cava Brut NV from Penedes, Spain, uses local white grapes like Xarel-lo, Macabeo and Paralleda. Cava is typically light and crisp and at only $19.99 a bottle, you can certainly open one up before NYE and on NYE too. Notes of fresh pear, apple, and citrus make this a friendly, simple wine you can serve with any appetizer. The Argyle Brut 2010 from the Willamette Valley in Oregon is bright and energetic. You’ll be thinking of lemon peel and strawberry notes when sipping on this one. It has light, fine bubbles but finishes off strong. This is one the few American sparkling wines worthy of your NYE flute. At $30.99 a bottle, this wine is worth every cent. The Gosset “Brut Excellence” Brut NV is an easy to drink Champagne from the oldest producer in the region. It has bold flavors of crisp apple, honeysuckle, and toast that blend together to bring you a delicious mineral tinged wine. Coming in at $45.99 a bottle, this Champagne is a surefire NYE delight. 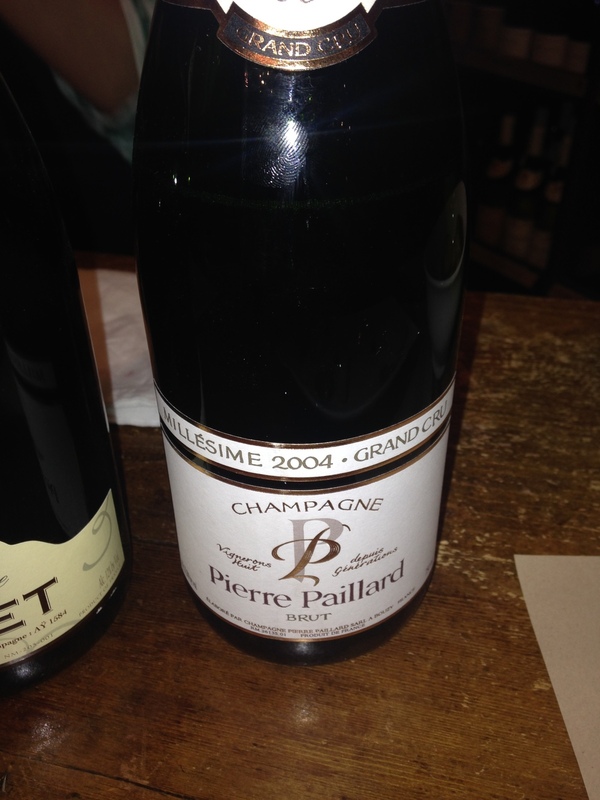 And finally, the Pierre Paillard 2004 Grand Cru from Bouzy, Champagne. It’s definitely a splurge at $65.99 a bottle, but it was my all time favorite of the night. It’s part Pinot Noir and part Chardonnay and aged for 7 years, making this a dense and complex wine. Notes of honey, almonds, and white flowers make it approachable and delicious. I could have kept sipping on this all night. How are you celebrating NYE? Will you be sipping on a sparkling wine? Let me know in the comments below. And of course, Happy New Year!